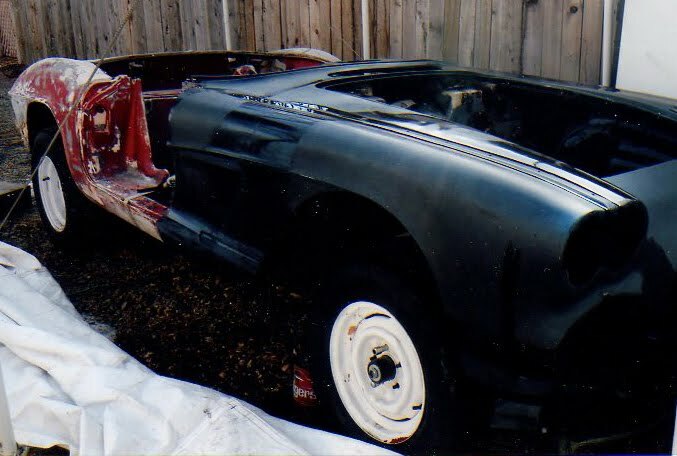 1961 Corvette convertible, possible Gasser or street rod, needs restoration. Hard top, new front clip and lots of miscellaneous parts. 327 engine and 4 speed. Clear Colorado title. CO location. Call GARY for info & pics. Need driver's side quarter-window molding for a '33-'36 Willys coupe or sedan. Any condition. A pair of (3) rocker molding for a '37-'42 Willys coupe; posi unit 4 series Olds/Pontiac 29 spline. Wanted: a pair of Henry's axles for '57 Olds 29 spline; Halibrand kidney-bean wheels, unpolished, 4 3/4 bolt circle, 4.5x15. Will trade for my 6x15 with 4 3/4 bolt circle. Looking for Isky 2" blower drive parts and Edelbrock blower manifold--both for small block Chevy. Also need B&M 4-speed Hydro trans, shifter, bell housing, etc. Original STEEL frame and body with repro. trunk pan - 98% metal work finished and under sealer - frame sandblasted - extra set front fenders - all original drivetrain, wiring, guages, mouldings, window cranks, interior parts less bench seat (but can get the original), etc... to restore this car to original (I can remove rockers) or to your desire - this was an original local car to my area and I know the history on this car for the past 47+ years - I also have many Dodge and Desoto hemis for sale - call DAVE for more info and photos. New Bill Mitchell 427 All aluminum small block engine, 525 horsepower, 2 Speed JW Transmission with Gear Vendor, updated Jaguar XKE type front and rearend with Wildwood brakes and coil over shocks, aluminum polished tilt steering column. All steel body. Has radiator, grill, tires and rims. All interior wood has been replaced. Car runs and drives, needs to be completed. Street legal. Death of Husband forces sale. Americar sedan. 98 % complete. Motor runs excellent. Would drive, if brakes were working. The body has some dents, but can be repaired. One rust through in the floor, just in front of the front seat (an easy fix). There is a very small spot of rust on the bottom of two doors. There is also rust through on the bottom-front edge of both front fenders. This is a decent car. I have owned it for a long time. I have a clear title. Need to sell to put the money into my coupe project. Call for more info. I can send more pictures. --One pair of Halibrand Sprint Magnesiums wheels size 16X11 with dual bolt circle patterns of 4.5 and 5 on 5. Back spacing is 3-3/4". Freshly polished and inner rim area is coated for going tubeless. $1850 plus shipping. --One pair of new in the box REAL RODDER'S WHEELS small kidney bean wheels size 15X4.5X4.5 Ford bolt pattern. These have the gray mag look retro finish on them and include lugs and caps. $900 plus shipping. Used Mallory Sprint Magneto II with mechanical tach drive, transformer and heat shielded plug wires for 340/360 Mopar engines. Recently gone thru by Joe Hunt. Can be converted for use on early Hemis. $475. Call or email for pictures. Health and health-related financial issues forces sale of my Willys. Coupe has 500 miles on it and only a few exhibition runs. A & C Body, Custom built chassis by Fast Times Rods, ZZ-454 700R4, 4:11, 9 inch rear, electric exhaust cut-outs. Famed Duncan-Nesbit tribute Gasser. 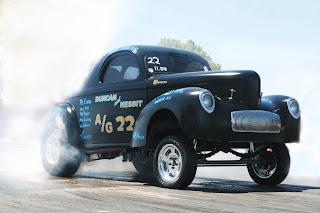 As seen in national magazines , at GASSER Reunions & on GASSER Nattiona t-shirt. May Trade for 55-56-57 Chevy plus CASH. 8.5 X 24, 5,000 lbs axle, spare tire, AC Lighting Inside & Out, Cabinets inside completely finished. Load level hitch. Tow my ‘41 Willys home in it!